Noise Pollution Calculator is a tool that helps you protect yourself from hearing loss. It gives you the maximal noise exposure time for a specified intensity level measured in decibel [dB]. If you work every day in a noisy place, you are a fan of loud rock concerts or a regular club session participant, check out our calculator to keep in mind how long you can safely stay in the particular sound volume. Noise is a sound of too high intensity (too loud), taken as unpleasant, onerous, pointless and harmful. International Labor Organization defines noise as each sound that may cause hearing loss, be damaging for health, or be dangerous for other reasons. Human body spends a huge amount of energy on defense against noise. Unfortunately, we cannot get accustomed to noise. Nowadays, multiple types of pollution are harmful for the environment. Everybody heard about air pollution, water pollution, littering, plastic pollution, or thermal pollution. However, noise pollution is one of the most significant and severe modern-day pollutions; still, we do not think about it often, or even do not realize it exists. It is also known as environmental noise or sound pollution. Noise pollution is made up of unwanted and excessive sounds that affect deleteriously human health and environmental quality. It is commonly generated inside industrial facilities and another kinds of workplaces. The World Health Organization (WHO), Centers for Disease Control and Prevention (CDC), and researchers around the world have been warning against the effect it has on human health for decades. The range of human hearing is 20 - 20000 Hz with amplitude from 0 dB to 130 dB or more, but it can vary a bit between individuals, especially for high frequencies. The human ear does not hear all frequencies equally well - the sensitivity peak is located around 3000 Hz. 0 dB does not represent an absence of sound but the softest sound that, on average, human ear can hear. Some people can hear below the zero level, down to -5 dB or even -10 dB (for example musicians usually have a lower hearing threshold). 130 decibels represents the threshold of pain. The human ear can tolerate sounds up to 85 decibels without damage. Anything louder causes a risk of permanent hearing loss. Scientific studies show that noise equal to or greater than 65 decibels can rises blood pressure, up heart rate and concentration of stress hormones in the blood. Over time we can get used to these sounds, but that doesn't make them any less dangerous. If you have an information about noise intensity in different units - W/m2 and want to calculate the decibels or you want to find out the sound pressure level, check out our dB Calculator. You can also take a look on our Speed of Sound Calculator out of curiosity, to check how the speed of a sound changes with temperature. Today's world is noisy. We are constantly surrounded by lots of different noises (especially in big cities - traffic, working machines, horns, etc.) and sounds (music through headphones, concerts, club parties). Hearing damage can affect each of us, but are we aware of it? Irreversible hearing loss may be caused by both constant exposure to loud sounds (85 dB and higher) and one-time exposure to extremely loud sound (120 dB and higher). We can observe hearing loss when a person has diminished sensitivity to the sounds audible for a regular person. The severity of hearing damage is categorized according to the increase in volume above the standard level of its detection . An audiogram is a basic examination which allows to estimate the hearing condition. It is a graph of the minimal noticeable sound level throughout the hearing frequencies range (frequency versus amplitude) run by an audiologist. Temporary hearing loss (Temporary threshold shift) - reversible. It is a reduced sensitivity to sound over a wide frequency range. It might occur suddenly after exposure to a high level of sound - brief like an explosion, gunshot, jet engine or longer: rock concert, nightclub party session. Hearing recovery to pre-noise level after that kind of incident usually takes 24 hours, but may take up even to a week. People who experienced temporary threshold shift may often also experience temporary tinnitus (ringing, buzzing, hissing - hearing sounds without their external source). So, after reading the above paragraphs, if you are wondering what your hearing condition is, try to find it out by making a professional audiogram. It is impossible to undo the permanent hearing damage, but you can start immediately to prevent it before its further progress. Calculations in the Noise Pollution Calculator - Maximal Exposure Time are based on "Occupational Noise Exposure" standards for workers, established by the U.S. Department of Health and Human Services - Centers for Disease Control and Prevention (CDC), National Institute for Occupational Safety and Health (NIOSH). The NIOSH limits are based on scientific studies relating noise exposure to hearing loss. They are focused on hearing protection. The main scientific evidence is the equal-energy rule (3 dB time-intensity tradeoff) -> every 3 dB increase in noise level requires the noise exposure time to be reduced by half. For every 3 dB decrease in noise level, the allowable exposure time is doubled. The standards assume that noise occurs as a part of a work environment and non-occupational quiet. Limits are based on an 8-hour workday, five days per week, over a 40-year working lifetime, and the time the individual is not at work (the other 16 hours in a day, as well as weekends) is assumed to be quiet. The standards do not cover other noisy activities and hobbies (power tools, concerts, car races) which may increase the risk of permanent hearing loss. 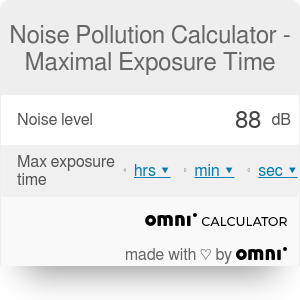 Noise Pollution Calculator - Maximal Exposure Time can be embedded on your website to enrich the content you wrote and make it easier for your visitors to understand your message.